I feel like this will be an ongoing series as I navigate the waters of real world dress codes. I begin a new job this week in PR and I can honestly say I don’t even own a pair of dress pants that fit. Last minute shopping, here I come! However, decisions have to be made since my budget is limited. As much as I love the look of pencil skirts, pants just seem more practical for sitting at a desk the majority of the day. I hate when skirts ride up my waist and create unsightly wrinkles. However, that doesn’t mean I want to lose sophistication. I like the idea of getting an ankle pant. It shows off shoes really well and looks great with blazers and button-ups. I really don’t want my decision every morning to be what color button-up shirt will I wear today. I think I’ll work into rotation each of these styles– the only piece I would need to get would be a turtleneck. I really like the monochromatic jacket and top look. I guess this isn’t much of a decision, just which is spend money on. It’s no secret that I love blazers. I plan on investing in one classic for work. Cardigans and sweaters are best in colors therefore I’ll be searching for deals. I apologize for the J. Crew overload. I love their work clothes. How do you dress for work? Any other great brands for reasonable wardrobes? Oh and club monaco also has some great “japanese double-weave cotton” ankle pants! Thank you! 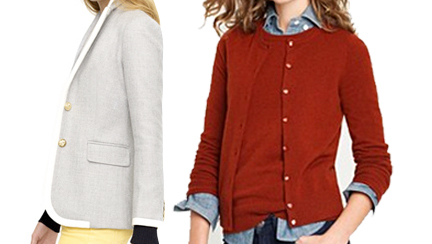 I found some great ones on sale at Ann Taylor and Banana Republic.